Settling on a choice of fitted kitchen for Ribble Valley homes and the surrounding Blackburn area is a decision that comes with challenges, but that doesn’t mean it has to be a struggle. As the kitchen becomes more important as the new heart of the home, people from across Blackburn & Ribble Valley will be searching for Blackburn kitchens that are in-style but also comfortable and practical. On top of this, people are always looking for kitchens with modern elements too, such as the latest technology and modern finishes. Ramsbottom Kitchens offer everything detailed above alongside a lot more. At Ramsbottom Kitchens we take pride in the personalised quoting and design service we provide, which also happens for be completely FREE for every customer living in Ribble Valley or Blackburn. Regardless of this, we never attempt to force our potential customers into any purchasing decisions. We never attempt a hard sell. In our eyes, an overall experience that is both informative and pleasant is of much greater benefit both to ourselves and our customers. It is thanks to these attitudes that we have great confidence in our ability to offer you what you need and complete any projects to your complete satisfaction. If you do opt to go with ourselves for your next fitted kitchen, we will require a deposit of just £10. The purpose of this is to put your own mind at ease, as it ensures that both the order and your money will be safe until the delivery of your new kitchen. For over two decades we have taken great pride in our partnering with prestigious brands and their cutting-edge product lines. Two of the biggest names we work with, Neff Appliances and Sheraton Kitchens, are each held in high regard across the kitchen industry. As the industry continues to grow and evolve, Ramsbottom Kitchens have continued to lead the way with kitchen technology through the introduction of the Quooker boiling water tap and Silestone Worktops. No other Blackburn kitchen fitter has one foot set firmly in the future quite like Ramsbottom Kitchens. One of the leading benefits for our customers is our enviable kitchen fitting service, which is completely adaptable and flexible to fit the needs of each individual project and customer. We are also available to assist in the construction of an extension bu using an external builder, or as an alternative we can deliver all units and items whenever necessary. Most of our work takes place during design and installation, at which time we get rid of your previous kitchen, complete all electrical work and any further jobs such as tiling, plastering and anything else that needs boxing off. We believe our fitting service is of the best quality you will find anywhere across Blackburn and the Ribble Valley. 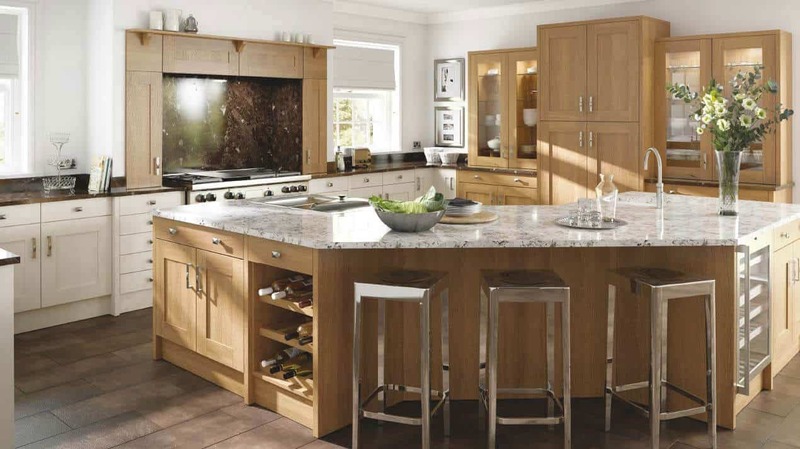 Selecting Ramsbottom Kitchens instead of other kitchen showrooms in Blackburn will benefit you for a variety of reasons. In comparison to bigger outlets, we never allow quality to become anything less than our top priority. As an example, we provide cabinets that are 100% ‘true rigid’, constructed through a mixture of dowel and glue techniques. Most other kitchen showrooms in Blackburn and Ribble Valley can’t offer you the unmatched quality of true rigid units. As well as this, every cabinet we provide comes in a choice of 11 colours, whilst larger chains tend to only do white. All our cabinets are individually painted for our loyal customers in the Blackburn area. Wait, there’s more. We have an in-house team of professionals who provide the best after sales support you will find anywhere in the area. This team will control the whole process, so you don’t have to, whilst keeping an open line of communication with yourself throughout any kitchen project. This often leads to happy, in-the-know customers throughout the process.